My latest op-ed appeared in The Virginian-Pilot Thursday. The subject, obviously, is the power grab of Senate Republicans. But those who follow Virginia politics recognized that something else happened Monday, something that will forever change us: the Virginia Way is no more. I have to say that witnessing the Monday’s actions has shaken my faith in democracy – and it takes an awful lot to do that. I’ve argued for years that state and local government is a heck of a lot more important than what passes for “government” in Washington; so much so, that rare is the case that I waste any time on the hopeless cause that is Congress. Washington has now come to Richmond. It’s not about us, it’s about them. It’s not about governance, it’s about power. Don’t give me the BS that “the other side did it” – that’s the kind of rationalization that should have been left behind about the same time you left first grade. Besides, didn’t your Mama teach you, as mine did, that two wrongs don’t make a right? Doing what’s best for the people of Virginia – The Virginia Way – used to be the guiding principle of those elected to serve in Richmond. I’ve long argued that principled Republicans and principled Democrats simply represent two views on the same issue; neither is inherently right or inherently wrong. Power grabs, though, are inherently wrong. Defeating the will of the people is inherently wrong. 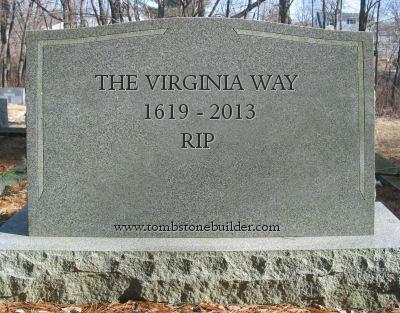 The death of The Virginia Way is inherently wrong. As I sat for an interview yesterday, I tried to convey that what had happened didn’t just affect black folks, it affected everyone. The young camerman seemed skeptical – he was relatively new to Virginia, and quite unaware of Virginia’s history: unaware that Republican used to be a dirty word in Virginia, unaware that Virginia Democrats were the ones fighting integration of the schools, unaware that Virginia Democrats, like a lot of Democrats in the South, fled the party and became Republicans over the issue of race. And certainly unaware that, despite all of this, Virginia’s Democrats and Republicans had somehow managed to work together to do what they thought best for Virginia. Rigging the game to circumvent the will of the people is not what is best for Virginia. Whether or not the speaker allows a vote on HB 259, whether or not the governor signs the bill, is irrelevant at this time. Senate Republicans singlehandedly killed The Virginia Way. Both parties put their finger on the scale when the extra weight offers enough leverage.. Does not make it right when either party does this.